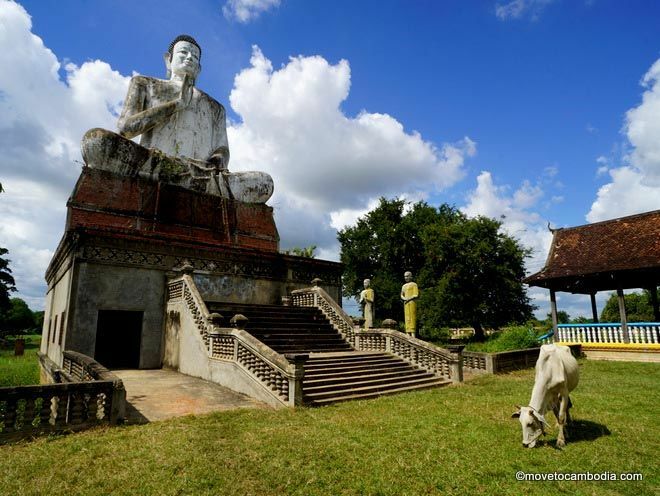 Where to shop for souvenirs and knickknacks in Battambang. 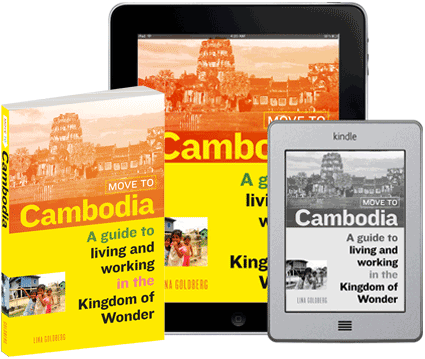 The shopping scene in Battambang is certainly expanding, but remains fairly small by comparison to Siem Reap and Phnom Penh. That said, the stores that are available offer a unique array of more unusual handicrafts and souvenirs. Bric-à-Brac, is a completely unique B&B run by Robert Carmack, an American food writer, and Morrison Polkinghorne, an Australian textile designer. They have an attached design showroom, where the duo displays goodies from their travels around the world, including pillows of antique Irish linen hand-embroidered with Burmese days of the week. If you’re lucky, Morrison will be behind the loom he built himself on site. They also stock natural Bodia cosmetics from Phnom Penh and there is a small cafe and wine bar on site. 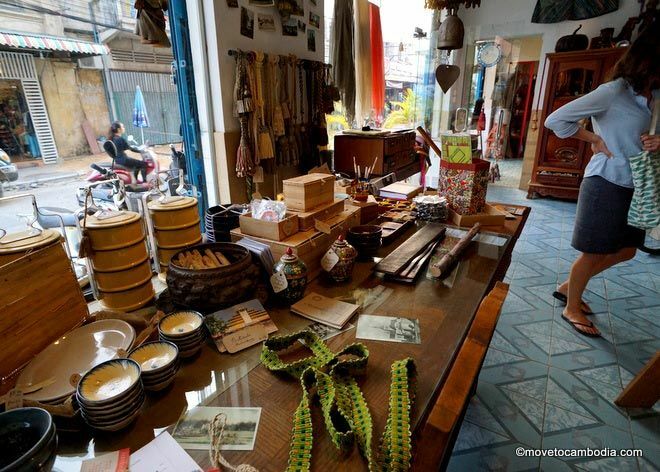 Battambang’s Bric-a-Brac curiosity shop and design showroom. As well as delicious food, drinks and snacks, Café Eden has a small selection of wares for sale. These items include clothing (mostly for females) made from unique fabrics, leather and cloth bags, leather-bound notebooks, scarves, jeweler and some gifts for babies and small children too. The Lonely Tree Cafe also sells a wide range of clothing (mostly for females), with some nice shirts and dresses made from traditional Cambodian scarves and kramas. They also have a broad selection of jewelry. Another store with mostly female clothing, jewelry and accessories, Coconut Water is linked to a social enterprise and with a small cafe upstairs. If you’re looking for a bargain, they have a nice selection of sale items upstairs. New to the city, French owned La Fabrik has an eclectic mix of modern jewelry and accessories, with a somewhat ‘bohemian’ feel. They also stock some local food products (oils, jams, spices), and cosmetics such as sugar scrubs and natural soaps. Next door to the delicious The Kitchen restaurant, Gecko has a large array of jewelry including some older and more traditional styles, as well as local handicrafts, scarves and souvenirs. 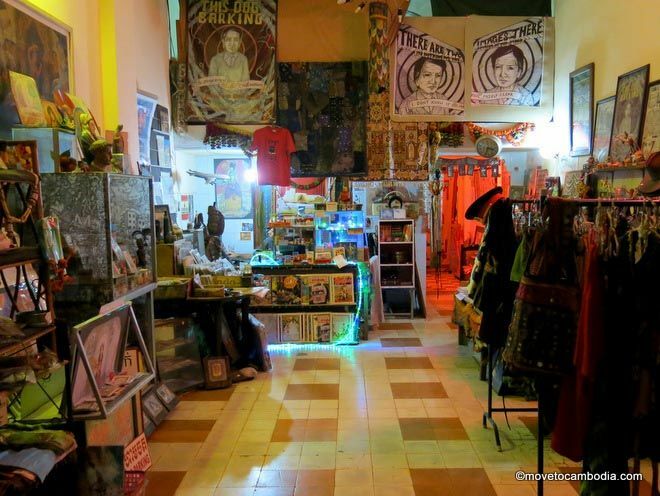 One of the most interesting store in town is Jewel in the Lotus, which bills itself as an “emporium of strange items and underground comics.” It’s entirely unique, filled with old photographs from Southeast Asia, novelty toys, SubGenius paraphernalia, zines, and comics. At Jewel in the Lotus you’ll find quirky gifts and oddball objects of desire. Psar Nath is an excellent local market where, in addition to fresh food, you can find homewares, tools, and the latest tat from China. Supermarket Heng Chhay Ly Mart has a good selection of household tools and housewares. For electronic items, Roads 2 and 2.5 between Psar Nath and Pub Street offer a selection of stores that carry larger electronics such as fridges, but also light fittings, fans, wiring and most anything you need. There is a larger electronics store at the Road 1 near the end of Psar Nath, and also on Road 3. Open daily except Tuesdays, 7:30 a.m. to 9:00 p.m.
Open Monday to Saturday, 8 a.m. to 6 p.m.
Open Monday to Saturday, 9 a.m. to 9 p.m., Sundays 4 to 8 p.m.
Open daily 7 a.m. to 9:30 p.m.